What could be better than sampling new beer with a few friends? How about sampling beer with 18,000 new friends? 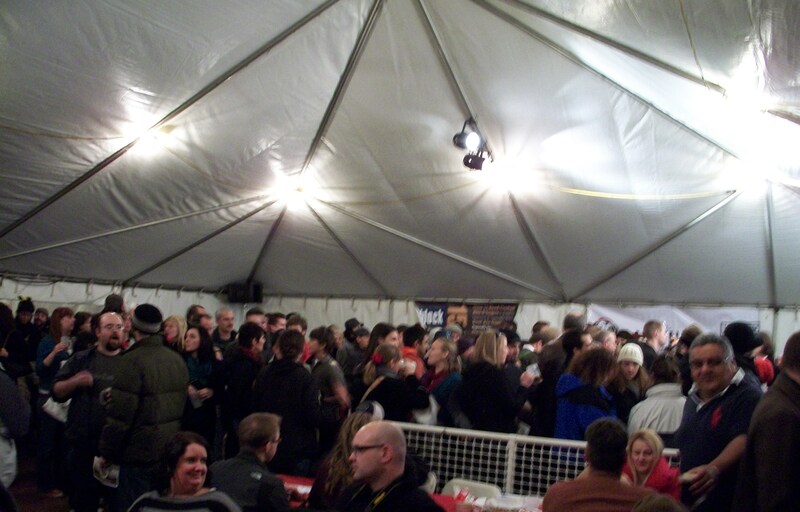 Well, on December 4th I had the privilege to do just that at the 2010 Holiday Ale Festival in Portland, OR. For $25.00 I was handed a mug and a small roll of tickets to sample some of the best winter warmers brewed this year. A sample taste was one ticket and a full pint was worth 4. Forty-seven brewers from all over the country brought their best winter ales, stouts, porters and barley wines to the event. Some beers were great, some not so much. So instead by trying to write about every beer I sampled, I’m going to give you my top 5 favorites from the 5-day event. Winter warmers are thicker and higher in alcohol so the casual drinker should really use caution when partaking in a pint. Normally, I’m not a Smoked Porter fan. But, Stone Brewing Company changed my mind with their Smoked Porter by adding Vanilla Beans into the brew. The first sip brings the wonderful toastiness of a nice porter and then carries a bit of the smoke flavor. But, suddenly the smooth flavor of vanilla and hints of chocolate and coffee mellow this porter down to a truly lovely beer. This is a nice porter and has the lowest ABV on my top 5 at 5.9%. Lagunitas Brewing Company took their popular seasonal Brown Shugga’ and kicked it up a notch for winter. Already brewed with a ton of brown sugar, the brewery added a touch of their Bourbon barrel Imperial Stout giving this cask conditioned porter a special kick. The flavor of the brown sugar and bourbon really come through making this porter and wonderfully sweet, smooth beer. But be careful, at 10.0% ABV, this porter should not be taken lightly. Switching gears on flavor, I really enjoyed this sweet yet sour ale. Cascade Brewing Company is known for brewing sour beers and Sang Noir did not disappoint. Deep red in color, this ale is aged for more than a year in Pinot and whiskey barrels. Sang Noir is then blended with a barrel of Bing cherries giving the ale a wonderful cherry sweetness and aroma. This ale is so delicious that it would be easy to forget Sang Noir is 9.5% ABV. I had a hard time putting this ale down so, again, drink cautiously! This wonderfully sweet (but not too sweet) Strong Ale was a close tie for first on my list. Brewed with English pale and specialty malts and molasses, Figgy Pudding is then matured in brandy barrels and conditioned with mission figs, Ceylon cinnamon and nutmeg. Block 15 then ages the ale further with English stock wild yeast. I enjoyed the sweet aroma and the taste of sugared figs. Figgy Pudding brought great visions of sitting by a fire on Christmas Eve. Or maybe it was the 11% ABV that gave me visions. Anyway, proceed with caution when approaching this delightful brew! My favorite beer of the event was also brewed with the most eclectic ingredients. North the Fourth is brewed with 60 pounds of cranberries, 40 pounds of spruce tips, and 2 pounds of candy canes (yes, candy canes). US Challenger and Czech Saaz hops are nicely balanced with 2-row malt giving North the Fourth an essence of chocolate and caramel. The candy canes give this ale a wonderful and interesting sweetness. Like most of the winter beers, the ABV on North the Fourth is quite high at 9.5%. I loved this beer so much I actually handed over 4 tickets for a fill pint. 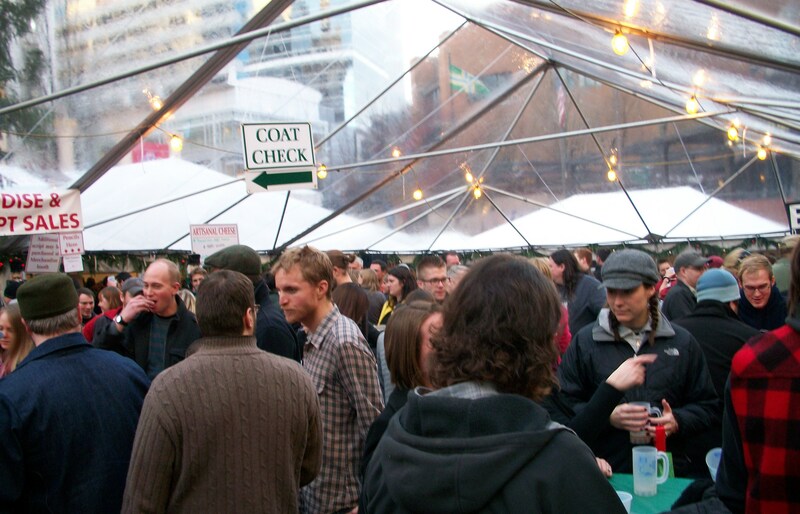 If you have never been to a beer festival, you are missing out on a good time. To be surrounded by other beer enthusiasts that wanted nothing more than taste and enjoy the new winter brews really made for a fun evening. Hi there this post is nice and interesting. I’ll use it for my project :). Can you reply me some related articles that I can read too? I would be more than happy to send you info. What type of info are you looking for?